I estimate the current annual implied inflation rate in Ukraine to be 92 percent. This is the world's second-highest inflation rate, far lower than Venezuela's 480 percent but slightly higher than Syria's 75 percent. 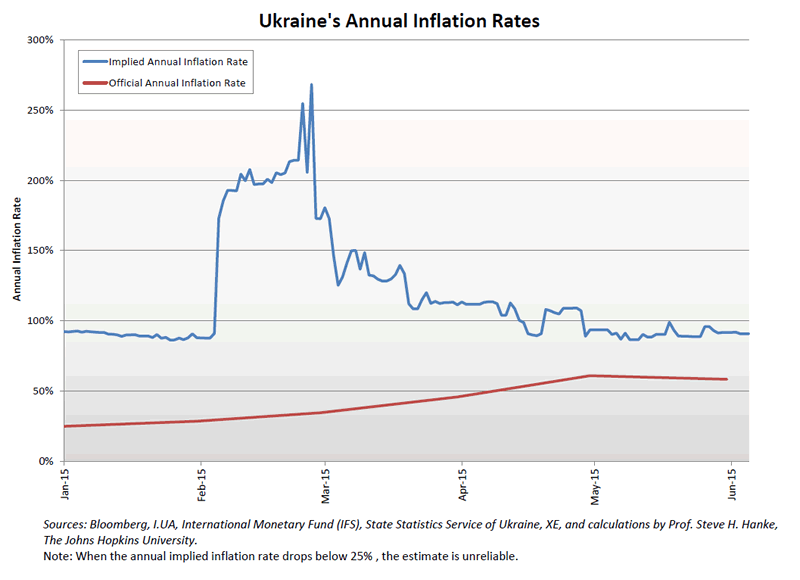 I regularly estimate the annual inflation rates for Ukraine. To calculate those inflation rates, I use dynamic purchasing power parity (PPP) theory. I computed the 92 percent rate by using black-market exchange rate data that the Johns Hopkins-Cato Institute Troubled Currencies Project has collected over the past year. A recent front-page feature article in the New York Times attests to the severity of Ukraine's inflation problem. Danny Hakim's reportage contains many anecdotes that are consistent with my inflation estimates based on PPP. For example, chocolate that used to cost 80 Ukrainian hryvnian per kilogram has dramatically increased to 203 Ukrainian hryvnia per kilogram over the past 17 months -- a 154 percent increase. On an annualized basis, this amounts to an inflation rate of 93 percent -- almost exactly the same number I obtained when applying the scientific PPP methodology. As evidence of the Alice in Wonderland nature of Ukraine's current state of affairs, President Petro Poroshenko penned an op-ed in the Wall Street Journal on June 11. The title of his unguarded, gushing piece perfectly reflects the sentiments contained in his article: We're Making Steady Progress in Ukraine, Despite Putin. The President failed to even allude to Ukraine's inflation problem. He is apparently unaware of the harsh realities facing the citizens of his country. He is also apparently unaware that his finance minister, Natalie Jaresko, whom he praises to high heaven, was recently in Washington, D.C., where she used a new Ukrainian law as cover to threaten a sovereign debt default. The reportage on these threats appeared in London's Financial Times on June 11, the same day the Wall Street Journal published President Poroshenko's op-ed.